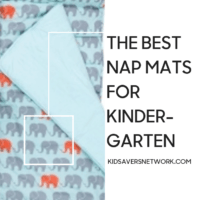 If you’re searching for the best kindergarten nap mats, you’ve found the right page! Nap time is an important part of a toddler’s life as it gives our little ones the time they need to rest and recuperate. It is essential that the kinder mat you choose is comfortable and safe. A good nap mat should be easy to clean, store and carry as well. 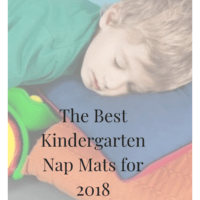 We take a detailed look at the best nap mats for preschool in 2018. Is it a 2 inch nap mat? Does it have a removable pillow? Does it have an attached blanket? Does it meet US Safety Standards? 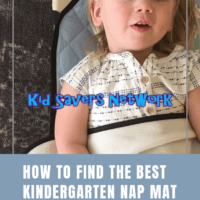 Here are some key points to consider when purchasing a kindergarten nap mat. Many kindergartens and daycares only permit 2 inch thick nap mats. You should check your local requirements before purchasing one. Also, check the actual thickness of the mat. What I mean is, sometimes the mat is only 1.5″ thick and the covering makes up that extra half-an-inch. If you read the consumer reviews of some nap mats, you’ll find a lot of complaints about the material. Sometimes the inner material is too “Scratchy” and not soft enough to make your child feel comfortable. Try to look for ones with breathable cotton inner-linings. Another important consideration is the noise they make. Some nap mats are very noisy and that won’t help your child make friends in Kindergarten. Most of the kinder mats we reviewed had removable pillows. This is a great idea, for a few reasons. You don’t need to spend extra on a pillow. It makes the mat easier to wash and the pillow won’t lose its shape in the wash, too. We found some nap mats with some great, over-sized blankets. A blanket helps kids wrap themselves up on cold, winter days and drift off to sleep. It also helps keep everything together so you won’t lose the blanket. And lastly, the added bonus is you won’t have to pay extra for a blanket as well. If you shop around, you can find a nap mat with a pillow and blanket. Just be sure to check how easy they are to wash! With 20 or so kids in your child’s day-care class, that’s a lot of nap mats and bedding to store. It’s preferable to buy a kinder mat that your child can learn how to roll, fold and store. Look for kinder mats with durable, Velcro fasteners to make this easier for them. It seems quite a few nap mats have been ruined by parents not being clear on the washing instructions. You’ll find many are fine to be machine-washed but they need to line-dried. Always check to see if the washing instructions are given and clearly stated. 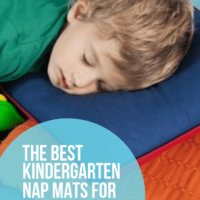 The top-rated kindergarten nap mats usually have industry-leading safety certifications. There are different certificates but always check to see your toddler’s nap mat passes the fire standards (especially flammability) and chemical emissions. I’ve looked extensively at all the kindermats available today and many aren’t 2 inches thick. A thinner nap mat might not be allowed in your child’s daycare. Plus it stands to reason that a thicker kindermat will be more comfortable for kids – and that should always be our main concern! In light of this, I was pleased to find the Orzak Mountain Nap Mat. 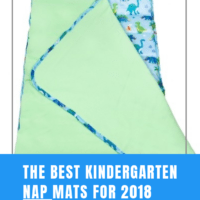 True, it is almost double the price than some of the kindergarten mats on this list. I’d also say that the colors and patterns available aren’t as endearing as the Disney mats, either. So why recommend it?! Is it worth the price? As well as meeting the “2 inch thick mat” criteria, this kindermat has blown in polyester fill. This means it’s like the mat has air chambers and provides a super- comfortable sleep. It has a sewn-in blanket and pillow as you’d expect, too. It’s also suitable for preschoolers up to 4′ tall! So you should get a lot of use out of it. As you can see from the photos, it rolls up into a backpack for our kid to carry. Personally, I’d fire the person who designed the colors for Orzak Mountain. 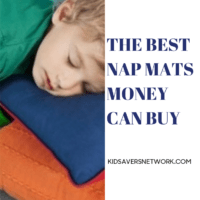 However, if you’re looking for a comfortable, thick nap mat that will last more than a few months the Orzak Mountain is one of the best kindergarten mats on the market. 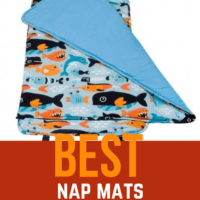 The Olive Kids Nap Mat has a perfect mix of cuteness and comfort. If your toddler is like mine, they are crazy about planes, trains and automobiles. Well, this kindergarten nap mat has all of those and also nice vibrant colors for them to love. For comfort, it has extra padding underneath the mat and pillow. And speaking of the pillow, it is removable so the whole thing can be machine-washed. There’s also an extra-large blanket so your little one can wrap themselves up and get some good rest. Removable Pillow – Extra comfort for sleepy heads and easy to wash.
CPSIA Compliant – Meets the CPSIA consumer safety standard. Vibrant & Cute – Bright colors and planes, trains and automobiles that toddlers love. Easy to Roll – Rolls up easily enough a 3 year-old can do it. Secures with 2 velcro straps. Easy to Carry – When rolled up has 2 shoulder straps for easy transportation. Good Padding – The pillow and mat are both padded to make sleeping on the floor comfortable. Big, Soft Blanket – The blanket is big and soft, perfect for children to wrap themselves up in. The Wildkin Aqua Mat has been described as “The Perfect Preschool Mat” by delighted parents. This kindergarten nap mat has a good amount of padding on the bottom to help make sleeping on floors more comfortable. It also comes with a removable pillow and over-sized blanket for your child’s extra comfort. It rolls up easily and secures together with Velcro for easy storage. The carry straps are a real godsend as you’ll always have your hands full when dropping children off. A really nice feature of the Wildkins nap mats is there are 22 different designs to choose from! Dinosaurs, Superman, Batman, butterflies, princesses and fairies…perfect for all little boys and girls. They also offer matching lunch boxes and backpacks which to help easily identify your child’s things. Choice of Designs – 22 designs for boys & girls including fairies, butterflies, princess, trains & dinosaurs! Removable Pillow – Comes with a comfortable, removable pillow. Easy to Wash – Simply remove the pillow and it’s good for machine-wash.
Good Padding – Well padded to making sleeping on floors more comfortable. Rolls Up Easily – Easy to roll-up and 3-year olds can do easily it with practice. Easy to Carry – There are carry straps and a big handle for easy transportation. Huge Blanket -Kids love the big blanket and it’s twice the width of the mat. Matching Lunch Box & Back Pack Available – Helps easily find your little one’s things. This kinder mat has been described as perfect for under 5s. If your child is big for their age; it might be too small by 4 1/2. My First Memory have produced a really comfortable kinder mat. It’s specifically designed for kindergarten / daycare and even comes with a blank name tag for you and your little one to personalize. The use of memory foam helps it rate high in the comfort stakes. Another good feature is the removable cover than can be machine-washed. There are quite a few reports of “Pilling” – where all the padding gets bunched up in the wash. With this mat, you don’t need to wash the cushioning so it won’t happen. The removable pillow also provides great head support to ensure your preschooler gets plenty of rest during nap-time. Soft and Comfortable – The memory foam and velour-like texture make it incredibly soft. Removable Pillow – The removable contoured pillow provides extra-head support. Removable Cover – The cover can be zipped-off and washed, protecting the cushioning. Easy to Store: Rolls up and has Velcro straps for easy storage. Easy to Carry: The large handle means the mat is easy to carry when you have your hands full. Ceerti-PUR-US: Has an Industry-leading safety standard for quality & safety assurance. Name-Tag: The included blank nametag is a really nice touch. Only 1 inch Thick: Some Kindergartens and States specify 2 inch thick nap mats. No Blanket Unlike some of the other leading brands, this sleeping mat does not come with an attached blanket. The Angeles Nap Mat is recommended by a number of Kindergartens / Day Care centers across the country. It has also qualified for “Greenguard Gold” certification, which protects children from harmful products in classrooms and schools. So, it’s safe, but is it comfortable? Well, the big selling feature of this kindergarten mat is the extra thickness and width. Most kinder mats are only around 1 inch thick. Over time, they will flatten out and provide less comfort for your little one. The Angeles is a 2 inch thick nap mat. This gives it more comfort and durability. 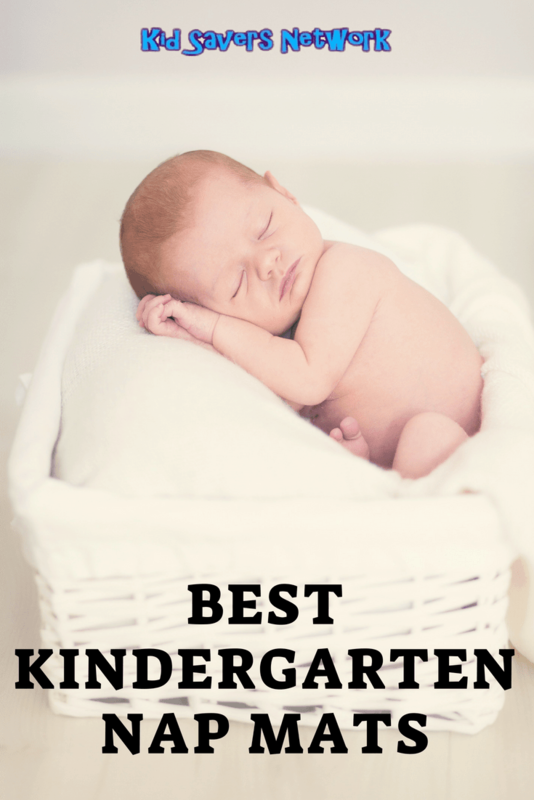 Particularly if your kindergarten / day care center puts the mats on a wooden floor. If you value safety and comfort over a cute Disney character, this is the one for you. Besides, you can always add stickers & transfers to the mat to brighten it up a bit. Extra Thick 2″ – Extra Comfort and prevents being flattened out over time. Very Durable – Has a triple ply, rip-proof cover. Easy To clean – Vinyl cover makes it easy to clean. Germ Proof – Resistant to germs and bacteria. Waterproof – No need to worry about spilling things. Greenguard Gold Certification – Product safety standard for children in classrooms & daycare. Bulky- It is bulky to carry which may be a problem if take it home every day. Spaced Gaps – Some parents worry the gaps between the sections are too large. If you’re buying for several kids, (or perhaps can club together with other parents) or for a kindergarten / daycare center you can make some great savings buying in bulk. These kindermats from ECR4kids are available in singles or as packs of 5. They are very similar in size and design to the Angeles Mat we reviewed above. The main difference is these mats have an attached name tag. You can also choose if you prefer a 3 fold or 4 fold design and 1 inch or 2 inches thick.